Infrared Thermal Image Scanning is a preventative maintenance process which assists in the reduction of emergency maintenance costs on electrical and mechanical equipment and is an excellent condition monitoring tool used to carry out non destructive testing. While the equipment is online and running under full load, you are able to monitor temperatures and thermal patterns. It allows for early detection of faults indicated by a rise in temperature. 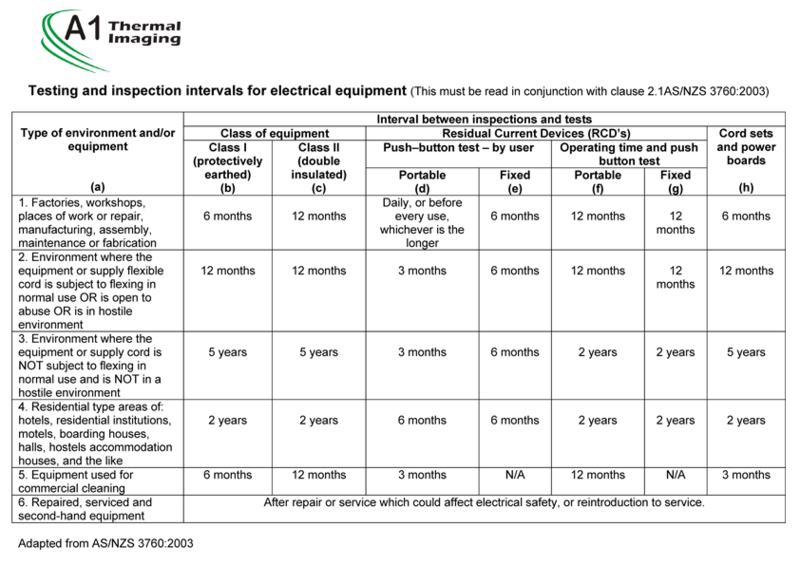 Your guideline would be the operating temperature limits that most mechanical and electrical equipment allows. Infrared Thermal Imaging can be used on a wide variety of electrical and mechanical equipment unlike most other test methods. Faults detected at an early stage can be investigated or repaired as part of a routine maintenance. Program or planned outage basis, thus reducing the need for unnecessary shutdowns. Infrared Thermal Imaging is an electronic technique which quite literally allows us to see thermal energy. Insurance companies and plant maintenance personnel have recognised Infrared Thermal Imaging as one of the most versatile and effective condition monitoring tools available today. Equipment failure and planning corrective action before costly shutdowns, equipment damage, or personal injury occurs can be predicted by using A1 Infrared Thermal Imaging services. As an employer you have a duty of care to provide a safe workplace for all employees as part of the Occupational Health & Safety (OH&S) Standards. Testing & Tagging your appliances reduces your duty of care as you are minimising the harm of electricity in your environment. As an employer must ensure that any risk of injury from electricity at a place of work is eliminated or, if elimination is not reasonably practicable, the risk is controlled. An employer must ensure that all electrical installations, electrical articles and associated equipment at a place of work are safe to use and are regularly inspected, tested and maintained to ensure they remain safe for use and are repaired or replaced if unsafe. An employer must ensure that a record is made and kept of all inspections and tests made and maintenance carried out on electrical articles and electrical installations required by this Part. The date by which the next inspection and test must be carried out. Click HERE to see the list of Australian Government Regulatory sites. How Often Should You Test? Where State Risk Assessments and Regulations are not in place, Table 4 of AS3760:2003 should be used as a guide. In NSW, the recently released WorkCover Checklist can be used as an alternative to AS3760. Click HERE to download the checklist to know how often you should scan.